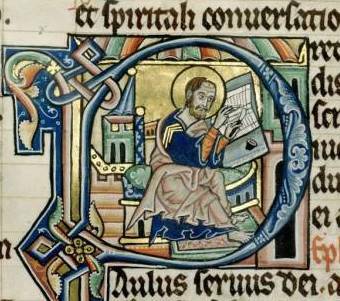 Before a single word flowed from his pen, the scribe needed to prepare the page. Whether he had opted for parchment or paper, the sheets were completely blank to start with. So, he first needed to think about a sensible layout, carefully considering his options. Did the text he was about to copy carry certain conventions? Was it, for example, a book that was to contain glosses (notes), or was it made for portable use? Preparing the page was a labor-intensive process, especially when the scribe had opted for a complex layout, with multiple columns and glosses. It was important to get it right since a messy layout would produce a messy book. 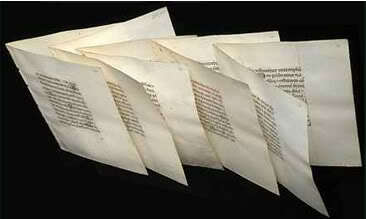 Unlike our notebooks today, medieval paper and parchment sheets did not come with ruled lines when you purchased them. A medieval page consisted of both horizontal and vertical ruling. To add these guiding lines to the blank page, the scribe would prick tiny holes in the outer margins, as well as in the upper and lower ones. Lines were then drawn between these holes, usually with the help of a ruler: horizontal lines to guide the space between each line of text, and vertical lines to confine the left and right side of the textblock. 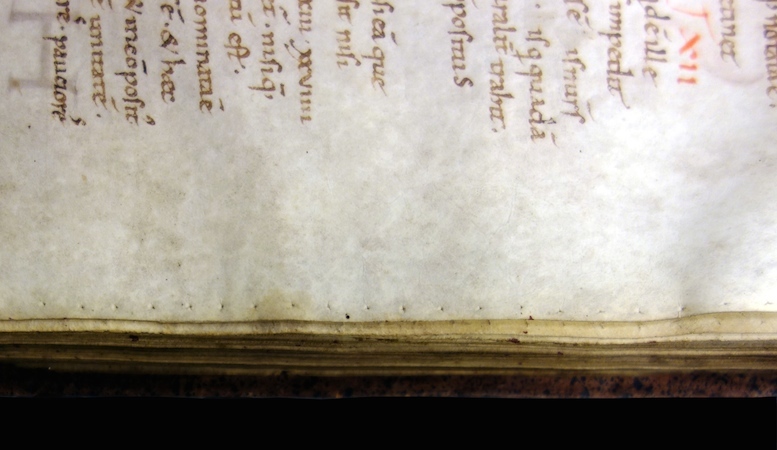 Until the early twelfth century the ruling was done by pressing down on the parchment with a sharp object (a “hard point”), producing a “gutter” that would guide the scribe’s pen. In the twelfth century this type of ruling was replaced by drawing lines with a pencil (called a “plummet”), which left more visible traces on the surface of the page. 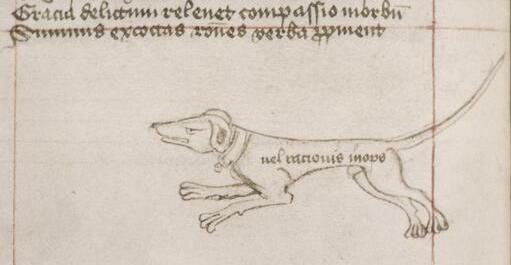 From the thirteenth century a pen was used as well. Because of all these horizontal and vertical lines, if a layout was very complex, the ruling pattern may appear as a true cobweb. How a page was designed depended on a variety of factors, including the number of required text columns, the space left blank for decoration, and the presence of marginal glosses and running titles. The most basic layout consisted of a single column of text. They are frequently encountered in Books of Hours (books made for use in private devotion), because these are commonly smaller books, which facilitated portability. Bigger books of two or more columns often required more work in the design stage, especially if that book also featured a marginal commentary. Particularly challenging were those cases where the commentary was of unequal length. This meant that the scribe had to design each page separately. Piecing together the segments of main text and commentary (see image) was like solving a puzzle. If the catchword at the end of the quire matched the first word on the next quire, then they were in the correct sequence. 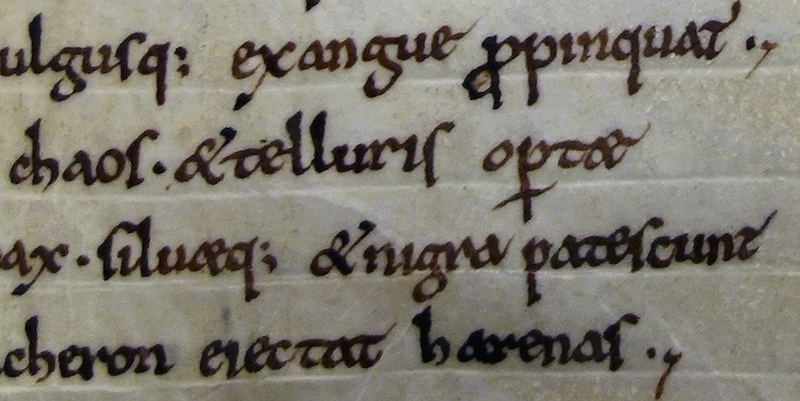 To help binders put the quires in the right order, scribes would also number them. In the later Middle Ages, further organization was added to the page by also numbering the individual bifolia, so as to keep track of their specific location within the quire. In spite of all this emphasis on location, from time to time binders still jumbled up the sequence. Quires are usually made from bifolia (singular: bifolium) or double-sheets of parchment or paper. To create a bifolium, a sheet is folded in half (each half is called a “folium,” which consists of two pages, i.e. the front and back of the folium). 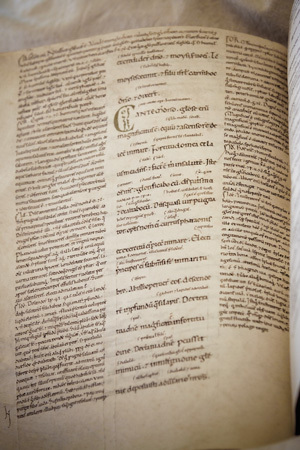 If the quire is the building block of the medieval book, the bifolium is what defines the quire: four, five or six of them were bundled up and subsequently filled with text. 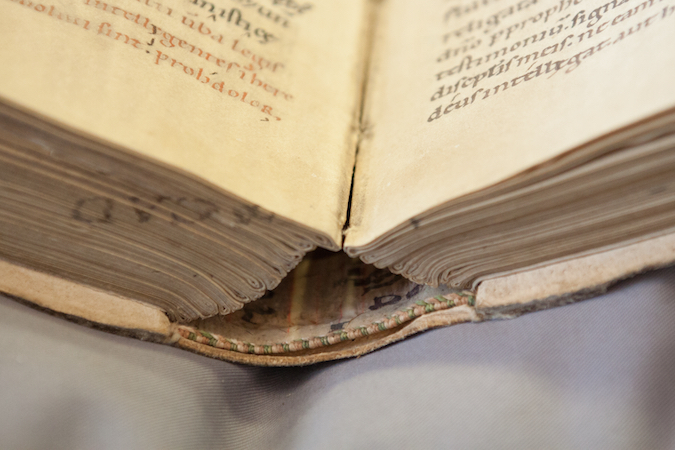 Looking closely at the binding of the book, each bifolium appears to embrace its neighbor, bonding together to produce a strong quire. Before roughly 1200, bifolia were usually cut from processed animal skins, each of which usually supplied usually one to four double-sheets. They were either cut from the skin, or the skin was simply folded, either once (folio), twice (quarto), or three times (octavo). Paper double-sheets were exclusively produced by folding the full sheet. 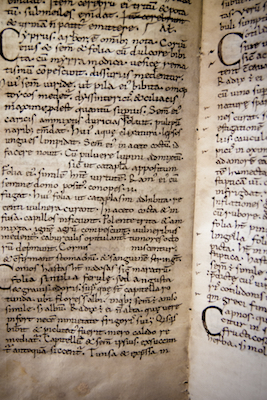 Quires form the building blocks of the manuscript. How many bifolia the scribe bundled together often depended on his or her location. Book producers in England, for example, are known to have regularly produced quires of six bifolia, while scribes on the continent typically preferred quires of four bifolia. Some quires are irregular. An extra folium could be added (called a singleton) or a leaf could be cut out. Such instances of irregularity are of great interest to book historians, because they may suggest that the original composition was expanded by the scribe (for which an extra folium was needed) or because a blank folium was removed at a later stage, for example because it came in handy for taking notes. Cite this page as: Dr. Erik Kwakkel, "The work of the scribe," in Smarthistory, August 8, 2015, accessed April 21, 2019, https://smarthistory.org/the-work-of-the-scribe/.